I did not really want to disturb my neighbours. Each night I would close the curtains without even glancing in their direction. My inquisitiveness was compelling and difficult to resist. After all, I had watched them move in and seen their soft furnishings. It was those eyes: sometimes staring up at me; sometimes with feigned indifference as I peered through the smeared glass to see if someone was at home. I took to sitting in the garden, surreptitiously monitoring their movements. I even watched them raising a family. Then one day the Cape Robins abandoned their nest. [Last summer a pair of Cape Robins nested in a lavender bush outside our french doors and I was able to observe them through the glass]. A Cape Robin joined me for tea in the garden this morning – flicking the dry leaves over to find the tiny insects hiding beneath them. I wake very early. Even as a young child I developed the habit of lying in bed while the household was still asleep, listening to the matutinal sounds outside. 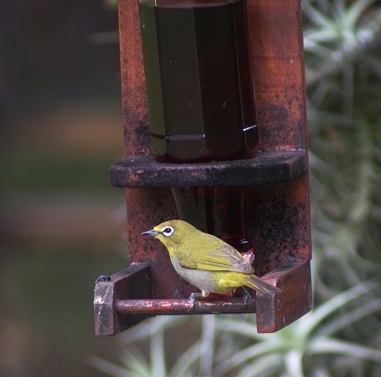 This morning was no exception: Cape White-eyes were the first to warble their way through the shrubbery outside my bedroom window. Oddly enough, the Hadeda Ibises remained silent until well after sunrise. 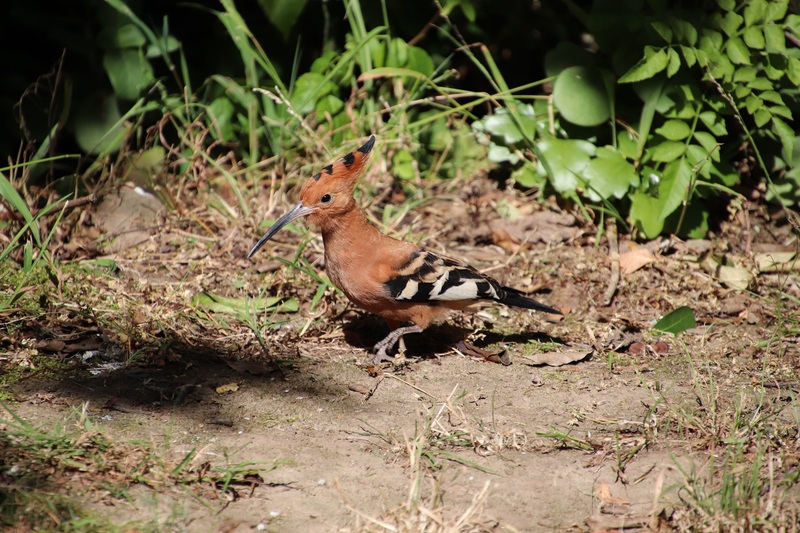 Instead, the infrequent cackling chorus of Red-billed (Green) Wood-hoopoes filled the garden with a joyous anticipation of a beautiful day. 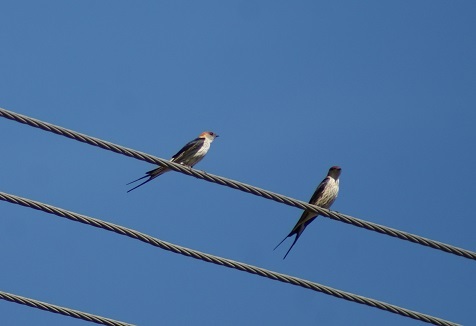 A beautiful day it is already, with Lesser-striped Swallows scything through the clear air, Black-eyed Bulbuls greeting the world and Black-headed Orioles calling from a vantage point out of my line of sight. 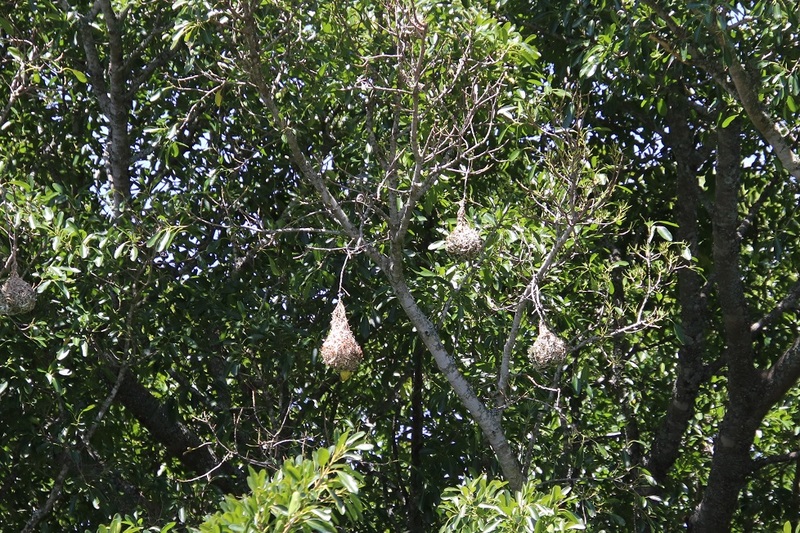 The Fork-tailed Drongos are already diving for insects and the Village and Cape Weavers are chirpily vying for the seed left over in the feeder. 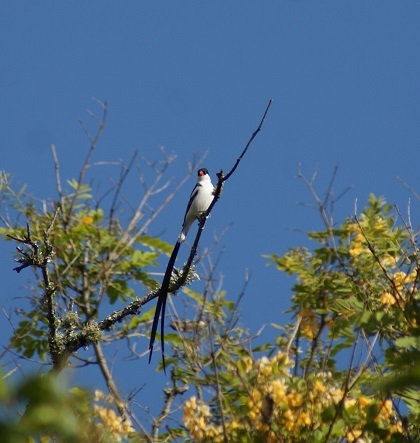 A male Pin-tailed Whydah is asserting his territorial boundaries. 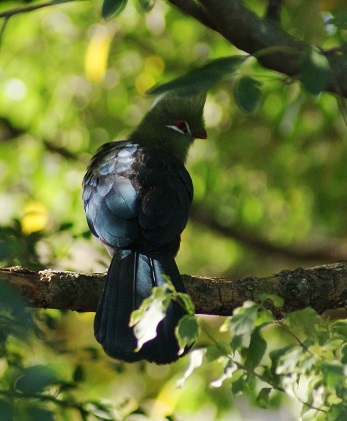 It is a pleasure listening to the fluting whistles and frog-like grunts of the African Green Pigeons from deep within the thickening foliage of the Natal Fig tree – already bearing tiny fruits – followed by the rasping sounds announcing the return of the Knysna Louries (Turacos). Laughing Doves are beginning to gather on the telephone cable and are taking up positions on the sunny branches of the Erythrina caffra – doubtless waiting for their ‘breakfast’! The distant sound of barking dogs alert me to the wakefulness of other people beginning their matutinal strolls, fanning their way through the suburb streets either to work or for healthy exercise. 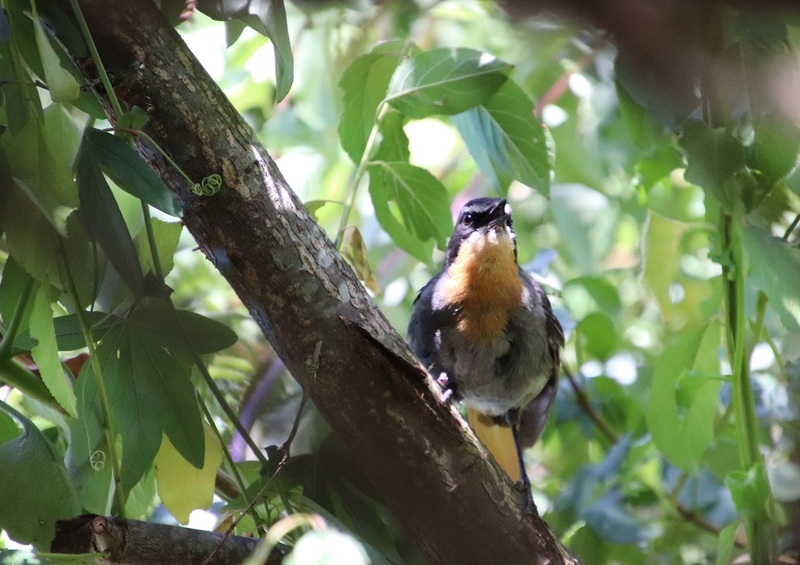 Traffic noise builds up quickly to almost blot out the call of a solitary Cape Robin. A Black (Amethyst) Sunbird flies past my window. Then a car hooter breaks the spell of my early matutinal pleasure – I haven’t even stepped outside yet! 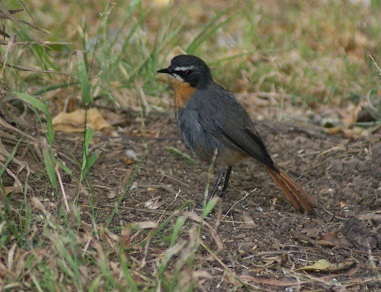 The Cape Robin was the first bird on my list this year. 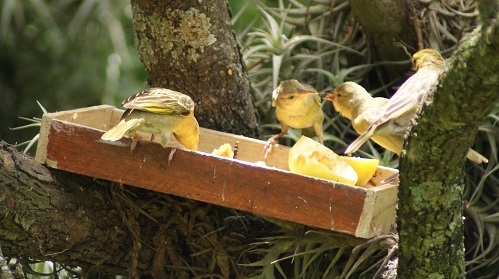 I feel blessed having them nest in our garden for they are such special birds. I frequently hear them before seeing them. Their calls range from what sound like melodious snatches of songs to a clearly distinguishable alarm call. Last night I listened to a robin calling nearby for about twenty minutes well after dark. They also form an important part of the dawn-chorus in our garden. 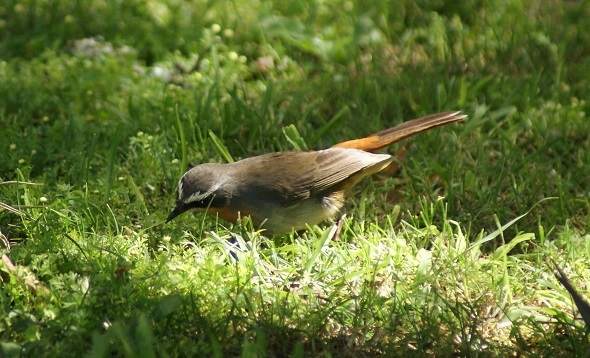 Over the years I have observed robins nesting just above eye-level in the air plants draped over a branch of an ironwood tree; almost at ground level in thick vegetation near a bird bath; in the tangled growth of an unkempt hedge; and more recently in the lavender bushes nest to the steps leading to our swimming pool. I have already chronicled the sad demise of their three chicks when they were devoured by a Burchell’s Coucal. 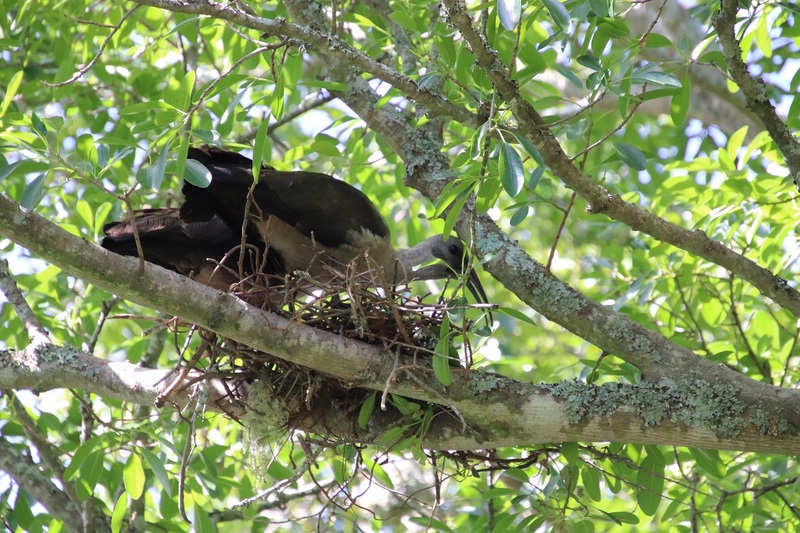 Undaunted, the pair relocated to the thicket behind the pool – too far in for me to see, although I noted their to-ing and fro-ing movements with food for their offspring. At least one of their chicks has survived for I have seen it out in the open in the company of a parent over the past two weeks. The spotty juvenile now makes forays around the feeding station on its own in the early mornings and late afternoons. Although it only appeared for three days, I was pleased to see a Dusky Indigobird for we last saw them here several years ago. Other new entries on my list include a Black Harrier, a Darter and a pair of Egyptian Geese. 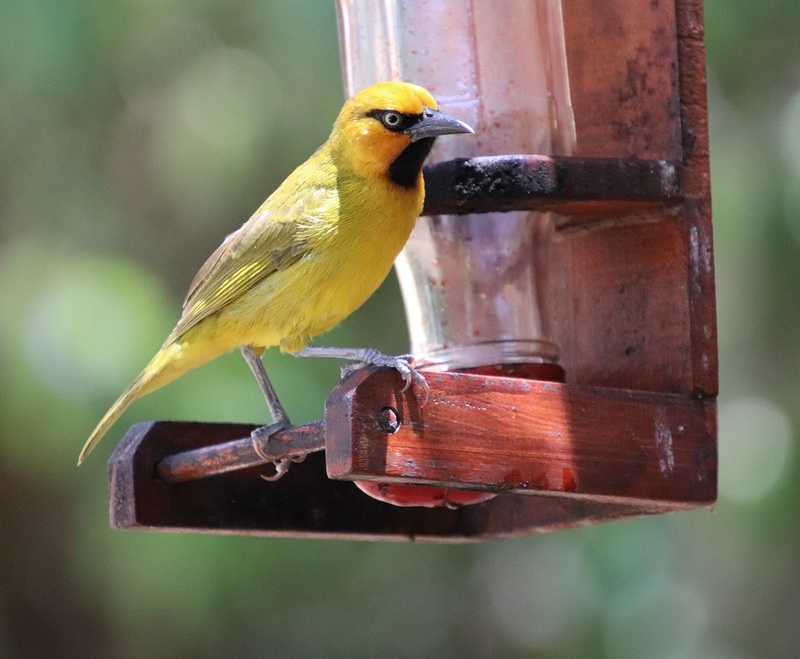 This has been a busy time for birds in our garden. 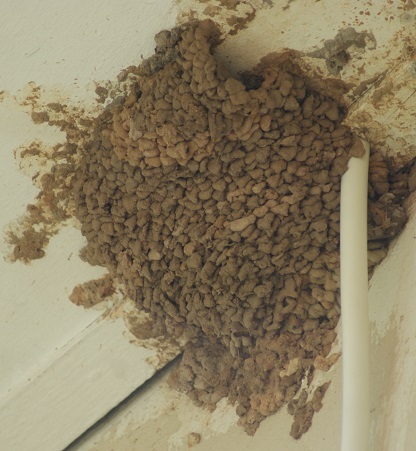 With some of the courting rituals over and nests built, many birds are now focusing on feeding their fledglings. A pair of Common Starlings brought their two chicks to feed on the lawn, seemingly teaching them to stab at the ground to find their food – and introduced them to the fruit on the feeding tray. Although a lot of the Village Weavers are involved with feeding their fledglings, chasing each other from the feeding station, and still courting, I recently observed a female collecting feathers from the lawn and cramming them into her beak. Once she could hold no more, she inevitably dropped some, returning a few minutes later to fetch them. It is wonderful the way no resources are wasted in the garden. The other morning I counted twenty-nine Laughing Doves perched on the telephone cable visible from my study, drying out in the early sunshine after heavy rain the night before. 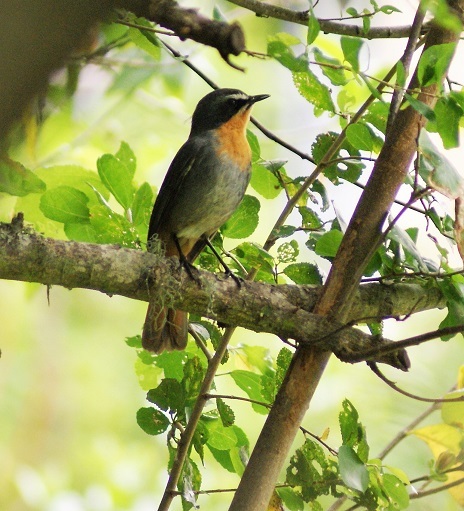 This month it was an Olive Thrush that apparently took a dislike to a Laughing Dove. It wouldn’t allow the poor dove to settle anywhere without chasing it around the garden and over the perimeter of it and back. A pair of Olive Thrushes nested in the garden next door and, after having carried food across for a while, recently brought their two speckled offspring with them. Their yellow gapes were still clearly visible as they begged to be fed but now these juveniles confidently seek food here on their own. I continued to enjoy the secretive way in which the pair of Cape Robins collected beetles and caterpillars to feed their young nestled within the lavender bushes and sheltered from the rain by the overhanging branches of the Buddleia salviifolia. 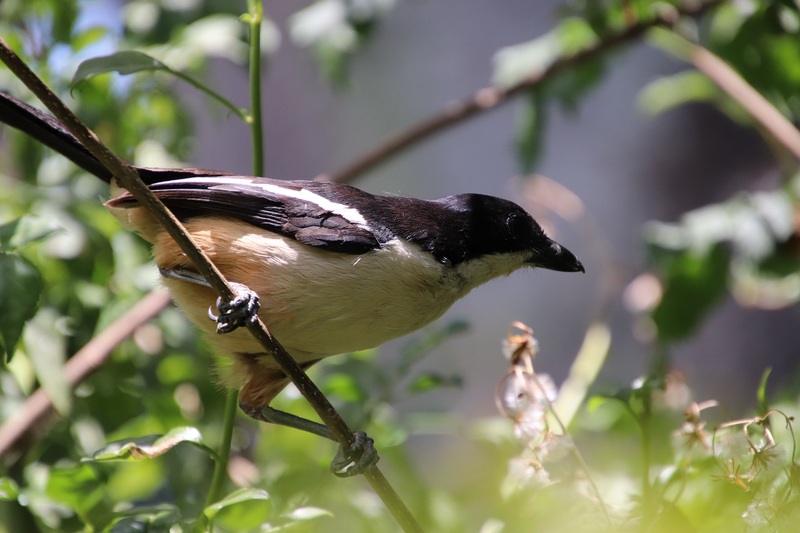 They would first fly to a nearby Pom-pom tree, then make it across the lawn to the windowsill of the lounge. 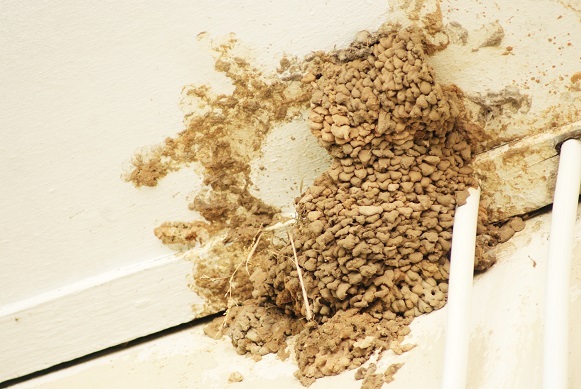 There they would walk along it until they were apparently out of sight then hop into the Buddleia before dropping down into their nest – such elaborate precautions to maintain the safety of their family! 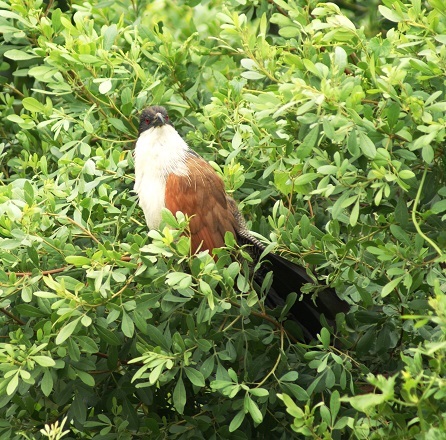 We are always pleased to see the Burchell’s Coucal in the garden. Having raised one as a chick many years ago, I am fully aware of their dietary requirements. 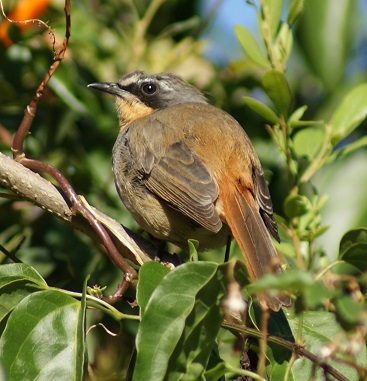 While I was pruning around the aloes on 7th November, I heard the Cape Robins making an agitated alarm call. Then I noticed several weavers leaving off their feeding to perch on top of the Buddleia – very strange. 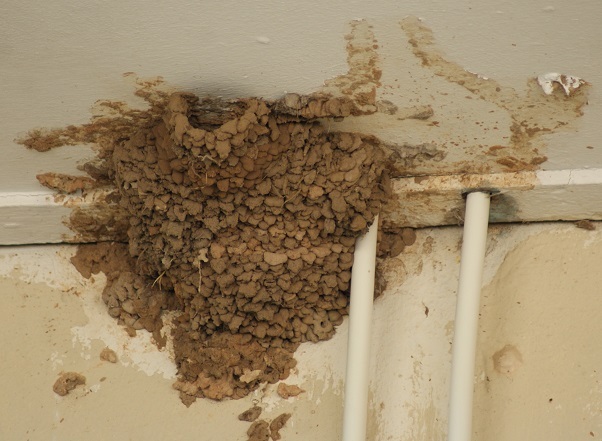 If you have read my entry HARK THE UNUSUAL NOISE from 7th December 2014, you will appreciate why I first thought that a snake may have found its way to the robin’s nest. I thus approached it with caution just in time to see a Burchell’s Coucal emerge from the lavender bushes while swallowing the last of the robin fledglings! 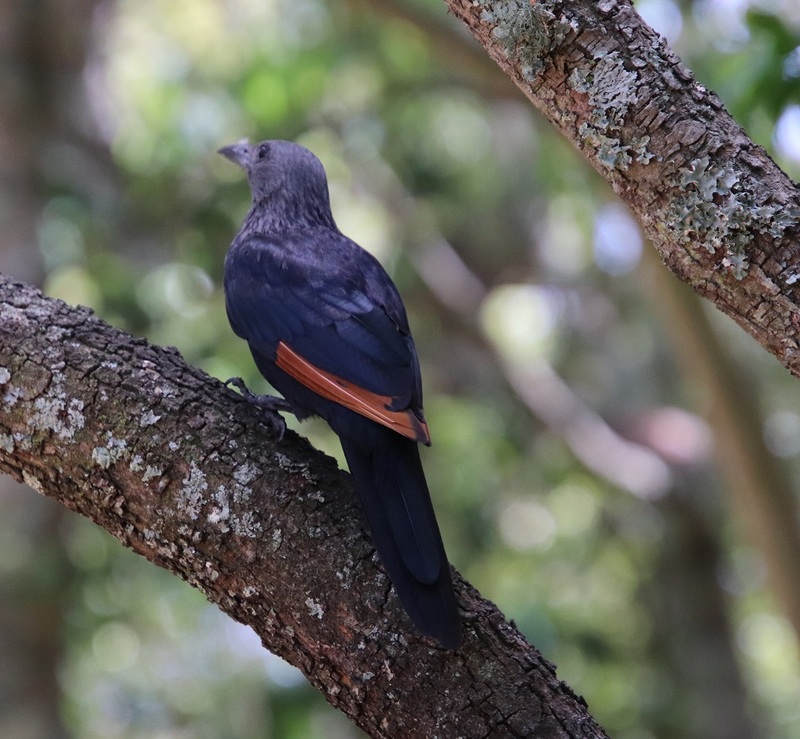 A few minutes later my attention was drawn to the agitated calls and unusual behaviour of a pair of Forktailed Drongos in the back garden. They were dive-bombing (probably the same) Burchell’s Coucal sidling through the thick hedge of Cape Honeysuckle. 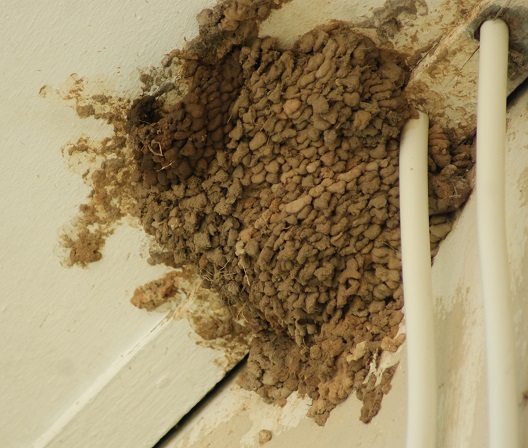 I imagine it had raided their nest too. Sad, but then it also has to eat. 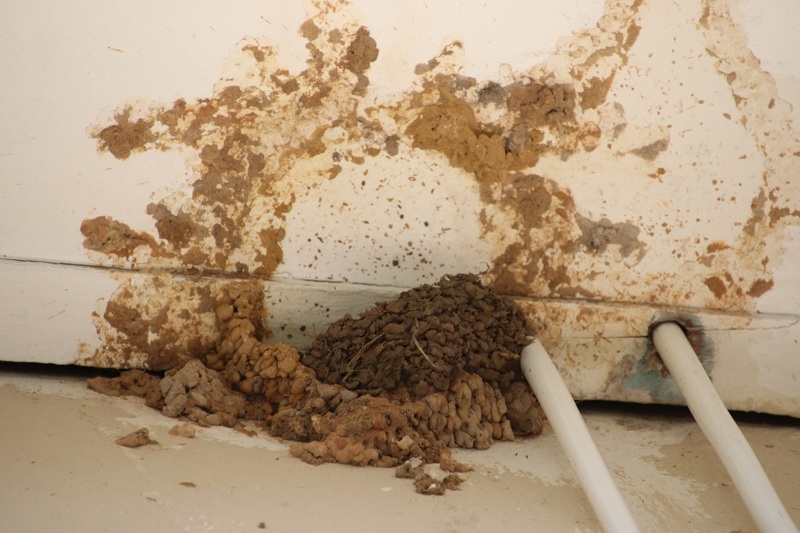 Much more delightful news is that the pair of Lesser-striped Swallows began to work on their mud nest under the eaves in earnest last week. They finished the tunnel entrance yesterday and I saw one peeping out of the hole early this morning. What a joy.